Going into the Urbana student missions conference, I was not very excited because I was feeling less than and less valued as a person. I had forgotten to accept God’s love and His truth. Growing up in a Christian home and environment was the one thing that kept me going. 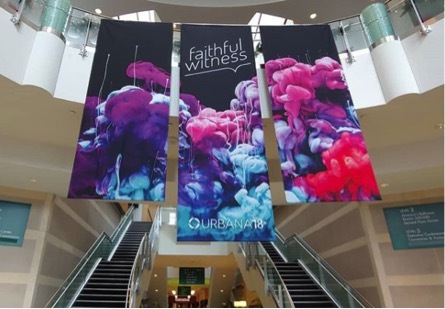 As I went to Urbana in the midst of events, I tried to prepare myself by saying that “may God take over this week as I dedicate all my attention to His Word and what He has to say to me.” This really got me thinking especially in the first few days of the conference. I had many worries and doubts, but the Lord had helped me push those aside and really focus on Him. The three things I learned were that I had to be attentive to His calling, to accept His love, and to invite Him in my decision making process. As I attended the various sessions and seminars, God spoke to me in a way to remind me that I had to let go of control and trust Him because He has a plan for me. I was able to come out of Urbana 18 learning that accepting God’s love is the first step in rebuilding a broken soul. I have to admit that although I thought I had improved my mental and emotional health, I have left out the most important aspect, which was God’s love. I had spent many nights believing in the lies of Satan and in time, I had began to say those lies upon myself. However, I have learned to detect God’s truths and to slowly accept them. In one seminar “Demystifying Spiritual Warfare,” the speaker, Tammy Gonzaga, had said something that really hit home for me: “The biggest battle is accepting His great love for us.” At that point, I had already accepted that I was broken, but had not fully accepted God’s love. I had this insecurity about love and not to mention, a warped image of love. Nonetheless, God had really put a theme on my heart, which was love, throughout that conference and into 2019. I learned that going into a missions trip I have to have a healthy relationship with the Lord and the intention to love on my neighbors locally and across oceans. Wherever God calls me to, whether it be my vocation or ministry, I believe that I have to act out in love and to portray God’s love. All in all, I have to say that my experience at Urbana has been memorable and definitely impactful.